Boylesports are offering £20 (€20) completely free when you place up to 5 stakes with Boylesports. Your first 5 placements will be matched until your total bonuses amount to £20. You should allow 1 day for the bonus to arrive into your account. Boylesports do not accept Moneybookers or Neteller as a method of payment for use with this offer. It is just under twenty years since John Boyle founded Boylesports but since 1989 the company has grown into Ireland’s biggest independent bookmaker. With telephone and internet opportunities, the company is now an integral part of the UK betting scene. Rules and tutorials for Poker and many of the other additional games are featured which will enable first time players to get up to speed with the rules and aims of these games. There is nothing particularly flashy or eye-catching about the design of the Boylesports site but it is very easy to navigate and new members will have no difficulties in adapting to the layout. The standard layout follows the standard pattern of a many sites making it likely a regular will adapt to Boylesports very easily. There is also a live chat facility for members to use if they encounter any difficulties. There is a perception amongst some that Boylesports offer a small range of sports but a cursory glance of their Sportsbook shows that this is not the case. All the major sports are featured and many others including futsal, UFC, lacrosse, netball, bowls and even chess are listed. Yes, if you feel inclined to place a bet on the Chess World Championship being held in October 2008, Boylesports are enabling this opportunity. There won’t be a great number of sites offering that possibility. Boylesports also offers up a number of specialist football bets with specific teams, players and even referees having a number of bets attributed to them. This level of in-depth betting may only appeal to a select portion of the overall market but it offers an interesting slant that will be of interest to many users. Given the sites Irish roots, it is unsurprising to see many bets featuring how well Robbie Keane will perform this season. Aside from the Sportsbook there is the usual selection of Poker, Casino, Skill, Bingo games and Lottery facilities. The range of lotto’s to choose from is the most impressive seen yet with Irish, 49s, Australian, Spanish, Canadian, French, German, Greek or Hong Kong lotteries all available. New users are able to receive £20 or 20 euros in free bets if they meet the terms and conditions on their joining the site. These conditions follow the standard terms and require the user to place a series of bets with their first bet being matched 100% and then following free bets being offered after every fifth deposit. Many users may not take advantage of the full £200 on offer but it is an enticing option if you plan on using Boylesports frequently with a sizeable amount of money. If a minimum of 5 euros is placed on a horse race that is shown on At The Races, Boylesports members will be able to watch the race live on their PC. With horse racing and football stats available, as well as a radio link for results, live coverage and articles, there is a fair degree of interaction possible through the Boylesports website. Mobile gaming is also enabled and the site provides live scores and results. 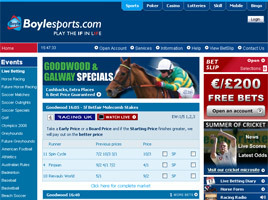 Boylesports are a consistent all-round option with a string range of markets and additional features. i want to play to 49s what i have to do ? Yes the offer worked for me, £200 is pretty good. Most Bookies don`t even give you half that in bonuses.